In May of 2012, the above photo of an ear of corn featuring astonishingly psychedelic colors made the rounds on the Internet. "NOT PHOTOSHOPPED!" blared the blogs. 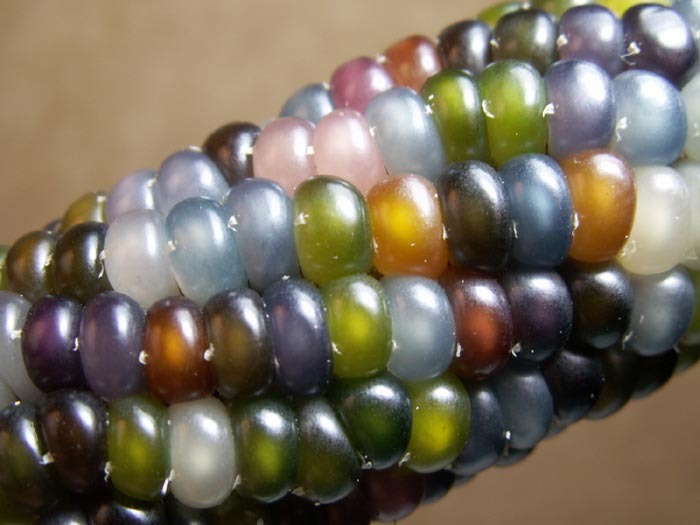 Being a rainbow aficionado myself, I briefly toyed with the idea of tracking down the seeds of this marvelous grain so I could grow it, but I didn't yet have a dedicated garden space. Besides, it wasn't yet commercially available. Later that year, I dug out three little 4'x4' garden boxes in my backyard, with permission from my landlord, and started dreaming about what to grow in it. The tiny amount of the fabulous corn seed available for the year was already sold out from the only company legitimately selling it, but I decided to take my chances with an eBay seller. 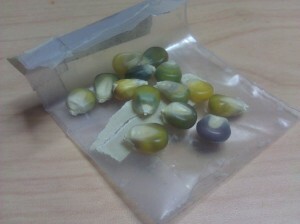 Finally I had my hands on a tiny Ziploc baggie filled with a few dozen nondescript nuggets of what looked like run-of-the-mill Indian corn. The whole episode had a slightly...ahem...seedy feel to it. I really had no idea where this corn had come from. The seller was new, and I wondered whether I'd let myself be ripped off, but there were no more seeds to be found and I decided to take the gamble. I planted them in May of 2013 and crossed my fingers. That must be a particularly robust pollen-producer. Most domesticated corn won't produce seed heads unless you have a large area with multiple adjacent rows. Great results! Katje, I absolutely love this contribution: it's about food, culture and the writer's personal history -- everything that makes food writing sing. I was just cleaning out my garden yesterday, and I was wondering if I'd even bother to grow anything next year, but your piece inspired me. I'm thinking of planting the Three Sisters, and I'm hoping one of that indigenous triumvirate will Glass Gems. David, that is indeed high praise coming from one of my food-writing heroes! Thank you so much for your kind words. I had considered growing the Three Sisters (and did put in a few squash seeds) but decided that my tiny patch was already pushing it for the limits of the space (as JoelF wisely points out above), and chose not to crowd it any further. JoelF, my husband Chouxfly will loudly attest to the robust nature of this particular strain's pollen, poor thing. mamagotcha wrote: I had considered growing the Three Sisters (and did put in a few squash seeds) but decided that my tiny patch was already pushing it for the limits of the space (as JoelF wisely points out above), and chose not to crowd it any further. And the squash itself can be a spacebuster on its own: My delicatas last year took over half my back yard, outside of the garden plot. This year, I confined them to the back of the garden plot, and only got four squash total, because of limited space and shade from the tomatillos. I'm seriously thinking of doing an "Indian garden" (that's how I've seen it referred to), which mingles squashbeancorn, without rows and, in the case of my garden, without excessive "tending." Wow,this really make me want to try growing this. Thank you very much for sharing your story,mamagotcha! Those corn ears remind me of the color cones in my eyes, and suggest that maybe there are some colors I didn't even knwo existed yet. I love that you grew this corn! I sent some to Freezer Pig, and am hoping that Glass Gem corn will make a cameo once in a while in his excellent farm stories!